Addressing chinese wedding invitation envelopes can be intimidating if you do not know what is the proper chinese title for your paternal grandmother¡¯s sister¡¯s husband or maternal grandmother¡¯s elder brother. But it is really simple. Just learn the proper chinese title for your relatives from the Three Generation Relationship Chart and follow these 3 steps. 1. 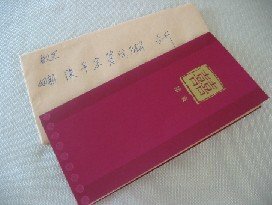 For chinese wedding invitations, the guest name is written on the envelope only. The guest¡¯s formal title will be used. Family friends and relatives are invited by the groom¡¯s or bride¡¯s parents. Only the groom¡¯s and bride¡¯s friends are invited by the young couple. 2. Remember to indicate if you are inviting the guest¡¯s spouse 夫妇，伉俪 or whole family ãØ¸®Í³Çë;. If you are inviting the whole family, then do follow up with the guest on how many seats to provide. 3. Usually ¡°升¡± or ¡°台升¡± is used after the name as a form of respect to the guest. ¡°升¡± described the upward presentation of the invitation card from a lower position. ¡°台¡± is an honorific reference for ¡°brother¡±, used in polite language in the olden days to address one¡¯s friend or acquaintance. or for the whole family ¡°XXX夫妇ãØ¸®Í³Çë¡±. Who should you send invitations to? In the past chinese extended family lived together under patriarchal rule. Chinese wedding invitations are issued by the groom¡¯s or bride¡¯s father under his father¡¯s 奉严命 or mother¡¯s order 奉慈命. Hence there is no need to issue invitations to his siblings, except to the husbands of his sisters. Moreover, wedding banquets in the past were conducted at the residence so guests will just turn up during dinner time. Nowadays, wedding banquets are usually held at restaurants or hotels and to prevent miscommunication, wedding invitations are also issued to the groom¡¯s and bride¡¯s paternal uncles. Remember to use ¡°家兄¡± meaning ¡°brother within the family¡± (blood brother) before the brother¡¯s name on the invitations¡¯ envelope. For relatives related by marriage, such as the wife¡¯s siblings, you can add ¡°姻亲¡± before the chinese name to indicate your relationship to each other. The title for the person will be added either before or after the name. For example, inviting the husband of one¡¯s sister will be ¡°姻亲XXX贤妹夫¡± or ¡°姻亲贤妹夫XXX 先生¡±. Find out how to address three generations of relatives on the wedding invitation envelopes. 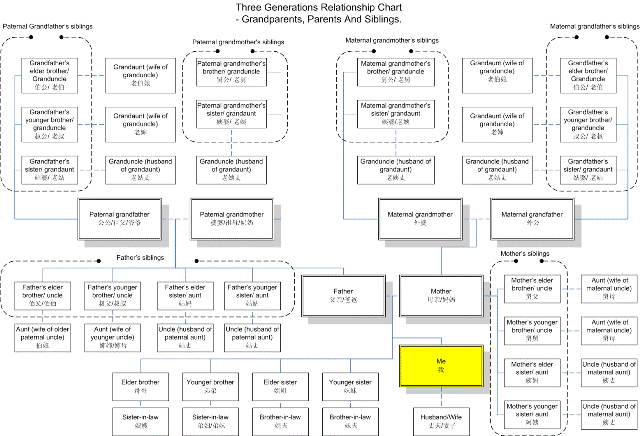 Refer to the Three Generation Relationship Chart- Grandparents, Parents and Siblings. Now that you know how to address chinese wedding invitations envelopes, learn how to write chinese wedding invitations.